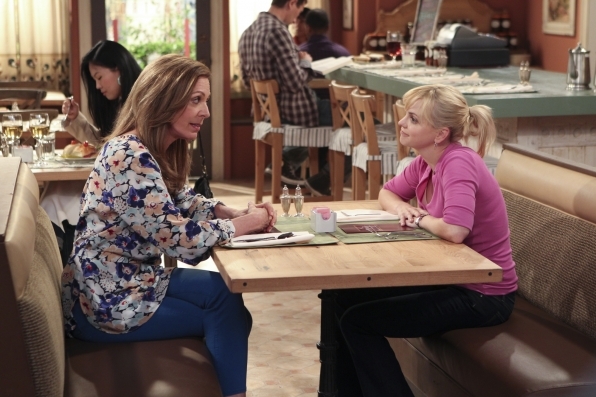 The pilot episode of Mom attempts an array of material, with many scenes faltering or completely falling through. The most interesting story concerns three generations of women attempting to reconcile their issues with their blaming of others, two alcoholics and a potentially pregnant teen, all following paths that were offered to them as inevitabilities in a quietly tragic manner. The lesser portion of the show sees French Stewart giving a performance that seems to be under the impression that Gordon Ramsey is the “hot new thing”. There is plenty of hope here, room for improvement with a focus on family and post-alcoholism. But then there are Grand Theft Auto jokes that South Park likely made in 1999. At the center of the show is Anna Faris, playing Christy, a waitress at a fancy restaurant and mother of two. She’s around four months sober, but is struggling to prove the transition to her daughter, Violet (Sadie Calvano). Violet can’t easily forgive her mother, which seems fair given our limited knowledge. The lack of reconciliation functions as karma to a certain degree, with Christy expecting forgiveness despite keeping that exact thing from her own mother, Bonnie (Allison Janney). When she isn’t dealing with her sexually active daughter or forgetful son, Christy weeps through her job, being set off by something as simple as being told that she’s a “good waitress”. Christy is also sleeping with the boss, Gabriel (Nate Corddry), who happens to be married. If it all sounds a little busy, that’s because it is, but the pilot episode wears the exposition fairly well. The best scene is set at an AA meeting. Faris is allowed to perform here, without the cloying or overly fatty tactics creator Chuck Lorre often resorts to. There are relatively long stretches without a burst from the laugh track, and the jokes that are told get responses from both the studio audience, and Christy’s AA “audience”. Lorre is not one to often let his characters be funny within the world of the show, so it stands out here, in the best possible way. Faris is great in the scene, selling the dramatics and humor with a cohesiveness of character that can be shaky this early in a show's life. Unfortunately, much of the material surrounding the AA meeting falls flat. All of the workplace humor is lazily constructed from much better and much lesser shows, from the cruel head chef to restaurant patrons reacting to their odd waitress (Jon Cryer’s cameo does not help). Corddry is forgettable, largely because he is given little to do beyond be married thus creating drama, though it is nice to see this problem befall a man where it can often be the other way around. The best thing the show can do from here is keep the restaurant material to one scene an episode until they can cut Corddry and Stewart from their contracts and have Faris begin working somewhere that better feeds into the tone of the rest of the show. Allison Janney, who is an absolutely perfect actress, swimming here in material that greatly underserves her, provides a majority of that tone. But Janney is a pro, so she brings a great deal of gusto to the role, providing a more relaxed attitude that nicely counters Faris’ sarcastic stress. Again, the stories that involve these two, and Christy’s daughter Violet, should be the focus of the show, and that’s certainly a possibility going from here. You could almost cut the work plot completely, especially given that the side characters at home are much better than the side characters at the restaurant. Violet’s boyfriend, a stunningly generic “shirtless pothead” is given more comedic space than expected by virtue of Spencer Daniels’ performance. And the father of Christy’s son is played by Matt Jones, last seen pitching a Star Trek episode in Albuquerque. Compared to the other new multi-cam sitcom I’ve seen this fall, Dads, Mom is a revelation. In the grander scheme of things, though, it stands currently as solid product, with potential battling against the suffocation of the lowest common denominator. In one corner, Faris and Janney are doing their best with the material given, the former continuing to prove that it’s a damn shame nobody ever bothers to give her a good script. In the other corner stands Chuck Lorre, who has far more creative misfires than successes. The points can’t be tallied until we’re further down the line, but as it stands now, Mom is a show worth checking in on. If it can wrangle its dark underbelly with its broad approach to comedy, there may be something here worthy of greatness.